Sophisticated and elegant. 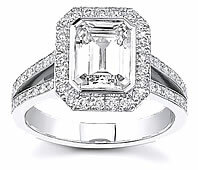 A beautiful emerald cut diamond is surrounded by many smaller diamonds which will bring a sparkle to her eye! A split-shank design featuring two bezel mounted brilliant round diamonds just below the center stone makes this 18k white gold ring unforgettable!